The guitar, currently a mainstay of popular music, has a l ong history and wealth of literature preceding its use in rock bands and college dorm rooms. The type of guitar that Allen Krantz and his students will be using is called the classical guitar (also known as the nylon-string guitar or the Spanish guitar). The main difference between classical and acoustic/electric guitars is the material of the strings. On a classical guitar the strings are made from either gut or nylon, whereas the acoustic or electric guitar have metal strings. Another difference would be the way that the guitar is held while being played. (For right-handed players) Classical is propped up by the left leg and the modern steel string guitar is played off of the hip. Music written specifically for this instrument dates back to the addition of the sixth string (the baroque guitar originally had five strings) in the late 18th century. In addition to these works written for the instrument, a classical guitar might play pieces originally written for lute, vihuela or the cello. The most well-known composer who did not write for the guitar is J.S. Bach; his baroque lute works are a mainstay in classical guitar literature. Not many concertos were written specially for the guitar, however in present times there are numerous concertos that are quite well-known. Antonio Vivaldi and Mauro Giuliani are Italian composers who wrote famous concertos for the guitar. Allen Krantz and his students will be performing literature from the classical guitar’s extensive repertoire with a focus on a few of these great Italian composers. A third Italian composer Nicolo Paganini, was also a guitarist. He once said “I love the guitar for its harmony; it is my constant companion in all my travels.” Paganini’s relationship with the guitar ha s only recently come to light – only a few of his compositions for the instrument have been published. The reason for this is disputed among scholars, but it appears to have something to do with the popularity of his violin works. Paganini’s work for violin seems to have overshadowed his guitar works during the time of his publications, when in fact Paganini work with technique was just as extensive on the guitar as it was with the violin. 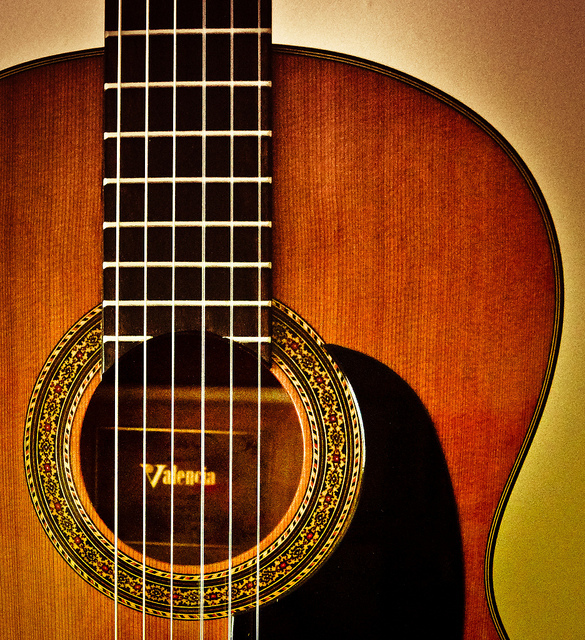 The classical guitar has been cultivated over centuries, building its repertoire and technique as various schools utilized this flexible and well-rounded instrument. Allen Krantz and his students will be presenting many fine examples of this unique instrument and we hope to see you Wednesday February 27th at noon for our Beyond the Notes concert series. Dobney, Jayson Kerr, and Wendy Powers. “The Guitar.” In Heilbrunn Timeline of Art History. New York: The Metropolitan Museum of Art, 2000–. http://www.metmuseum.org/toah/hd/guit/hd_guit.htm (September 2007). Heck, Thomas F., Harvey Turnbull, Paul Sparks, James Tyler, Tony Bacon, Oleg V. Timofeyev, and Gerhard Kubik. “Guitar.” Grove Music Online. January 01, 2001. Oxford University Press. Stephanie George is a second-year masters student in Music Theory at Boyer College of Music & Dance. Stephanie completed a B.S. in Music Education and a B.A. in Music (concentrations in clarinet and music theory) from Lebanon Valley College in 2015, after which she secured a placement with Harford County Public Schools as a music teacher for Havre de Grace Elementary. Her master’s thesis applies narrative theory to Chopin’s second piano sonata using a variety of analysis techniques. Her research interests include Sonata Form, Narrative Theory, Schenkerian Analysis, and Pedagogy. After completing her masters, Stephanie plans to pursue a Ph.D. in Music Theory. This entry was posted in Beyond the Notes, Performing Arts News, Uncategorized and tagged Beyond the Notes, classical music, concerts, free, Noontime Concert Series, Top News. Bookmark the permalink. Trackbacks are closed, but you can post a comment.